The reactions to the KRG’s policy to conduct a unilateral referendum on independence – which garnered a majority vote of 92.73 percent – could be considered the climax of a pre-existing crisis in the relations between Baghdad and Erbil dating back to the status quo ante, i.e. before the referendum. This paper focuses on the international impact of the 25 September referendum, and specifically on Kurdish relations with the US and Russia in its immediate aftermath. It could be argued both that the US response represents a challenge for the Kurdistan Region in Iraq, and that, for three reasons, this challenge is not new. Firstly, the new US presidency, mired in a series of controversies and enjoying only questionable domestic support, has structurally complicated the already delicate implementation of a coherent US foreign policy in the Middle East in general and in Iraq in particular. Secondly, this has been further exacerbated by the traditional US foreign policy process whereby different bureaucracies, be they Congressional, the State Department or the Department of Defence, develop different stances about the same issue. This has been particularly the case regarding Kurdish affairs. Thus, the referendum has impacted not so much strategic Kurdish-US relations per se, but rather Kurdish society itself and its political system. Finally, US fears of potential instability in Iraq have crafted its traditional guiding principle of the “balance of power”, which dictates US practice today just as it did in 1991 and in 2003, when Secretary of State Colin Powell declared that the US “was in favour of the territorial integrity of Iraq, where Kurds, Shiites, and Sunnis could find a way to live together”. As long ago as the 1980s, despite its opposition to “Iraqi military activities against the civilian population and the destruction of hundreds of villages in Kurdistan”, the US nevertheless refused to support, or in any way associate itself with, the 60 year-old Kurdish rebellion in Iraq. The aftermath of the referendum did not herald a definitive change in US-Kurdish relations. The referendum itself could be perceived as a pause, with the KRG insisting on a policy perceived as counter to US interests. Brett McGurk asserted from 13 July 2017 onwards that this was not “the time to hold a referendum.” However, this brief interruption in the alliance of Kurdish policy with US-Iraqi interests has not affected the continuity of US strategic relations with the KRG. Apart from US economic or geopolitical interests in the KRI, the cornerstone of this relationship remains defence and security (the main US priorities in the region), and the role that the Kurds can play within this context. According to the Kurdish General, Najat Ali Salih (in an interview with the researcher in Erbil, 3 December 2017), “the training and the reforms program by the coalition forces in cooperation with the Ministry of Peshmerga has started again”. Institutionalisation of the Kurdish army is in progress, as stated by the Minister of Peshmerga Karim Sinjari (interviewed in Erbil on 4 December 2017), through “a committee [comprised of] the British, US and Germans that [will] undertake this implementation” in the context of a Memorandum of Understanding (MOU) signed on 12 July 2016 between the Ministry of Peshmerga Affairs and the US Department of Defense. The unification of the Kurdish army under the supervision of NATO, along with the ratification of $365 million in congressional funding for the Peshmerga laid out in the US 2018 Defense bill (National Defense Authorization Act -NDAA) and the establishment of five US military bases (one in Atroush region, two in Harir region and two large bases in Erbil and Duhok) in the region are indicative examples. US discourse in support of the KRI remains strong with the US consul-general in Erbil, Ken Gross, emphasising that “it is not US policy to abandon the Kurds or the government in Kurdistan” and underlining the need for a stronger commercial relationship on the economic level. Given the status of the Kurdistan Autonomous Region as a de facto state entity, the strengthening of Russian–KRG relations since 2 June 2017 and the Russian reaction to the referendum is particularly intriguing. Contrary to the US’ multi-faceted relations with Erbil, Russia has a primarily economic interest in the KRI, which Moscow defends explicitly in those terms. 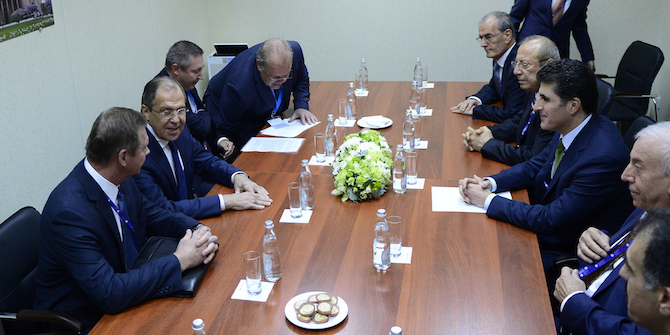 Interestingly, prior to the outcome of the referendum, Moscow expressed political support for Kurdish independence from Iraq through Foreign Minister Sergey Lavrov. This stance was undeniably more supportive than the US position. However, in the aftermath of the referendum Moscow mainly committed to its economic relations with the KRI. Following Rosneft’s oil deals (investing in five oil fields) with the KRG, Russian Energy Minister Alexander Novak reaffirmed “there is no barrier in the way of us [developing] our relations with the Kurdish people. We will do it”. Thus Moscow remains committed to its energy agreements in the KRI (October 2017) to the extent that Minister Novak asserted Moscow’s “will to connect the Kurdistan Region’s oil and gas pipeline to the Black Sea”. This is in stark contrast to President Trump’s assertion, following the consequences of the border-violating coup d’état on 16 October 2017, that “we are not taking sides in that battle.” Here, the President stood in opposition to the Congressional House of Representative Resolution 534 (25/09/2017), according to which the people of the KRI have the right to determine their status as a sovereign country. In the aftermath of the 25 September referendum, then, the KRI maintained (a) economic relations, primarily with Russia, with its re-entry into Iraqi affairs through a firm partnership with the KRG and (b) its strategic alliance with the US, with further joint attempts to institutionalise the security sector. Finally, on the political level the KRG is currently re-engaging with both the Russian and US administrations, with some leverage over the latter as the main player in Iraq. Despite the challenges caused by the referendum and given the constant regional changes, Erbil is successfully balancing between these two international powers. However, the role that these two competing powers might play in the facilitation of the KRG’s policies remains to be seen. Marianna Charountaki is a lecturer in Kurdish politics and international relations at the University of Leicester, and the Director of the Kurdistan International Studies Unit. She is the author of The Kurds and US Foreign Policy: International Relations in the Middle East since 1945 (Routledge, 2010) and Iran and Turkey: International and Regional Engagement in the Middle East (I.B. Tauris, 2018).